How to reach Kullu Manali by flight, road and train. Manali is one of the famous hill station located in Himachal Pradesh (North India). Manali has lots to offer for tourists with breathtaking views along with several activities to do and much more. Manali is also well connected with neighbour cities like Delhi, Shimla, Dharamshala, Chandigarh, and Amritsar. Highway widening work is going on full swing. Consequently, travelling time by road between Chandigarh and Kullu Manali will be reduced. The nearest Airport from Manali is Bhuntar, which is Approx. 50 km from Manali. As of now, only Air India is operating flight between Delhi and Bhuntar. One needs to visit Air India’s website for more details. Air India has also started Bhuntar Chandigarh and Chandigarh Bhuntar Flight. Chandigarh is one of the nearest Railway stations from Manali and it is approx. 312 km from Manali. It will take approx. 7 to 8 hours to reach Manali from Chandigarh by car. In the month of May and June, some private operators also run Cessna Aircraft between these two places. HRTC ( Himachal Roadways Transport Corporation ) is also running Volvos and ordinary buses between Chandigarh and Manali. The distance between Delhi to Manali is approx. 540 km and it takes 11 to 12 hours to cover this distance by car. HRTC and HPTDC are running Volvo buses between Delhi and Manali. A lot of private players are also providing same services. One can have Train journey between Delhi to Chandigarh and then travel by road to reach Manali. Air India is operating daily a flight between Delhi and Bhuntar. One of the fastest ways to reach Manali from Mumbai is by taking a direct flight from Mumbai to Chandigarh then travel by road to reach Manali or take the Air India Flight from Chandigarh to Bhuntar. The other way is taking a direct flight from Mumbai to Delhi then take another flight from Delhi to Bhuntar Airport. The Distance between Shimla to Manali is approx. 250km and it takes 7 to 8 hours to cover this distance by car. In future, travelling time will be reduced due to 4 Lane highway between Chandigarh to Kullu Manali. There is no flight connectivity between these two places as of now. HRTC is running Deluxe and Ordinary buses on this route. 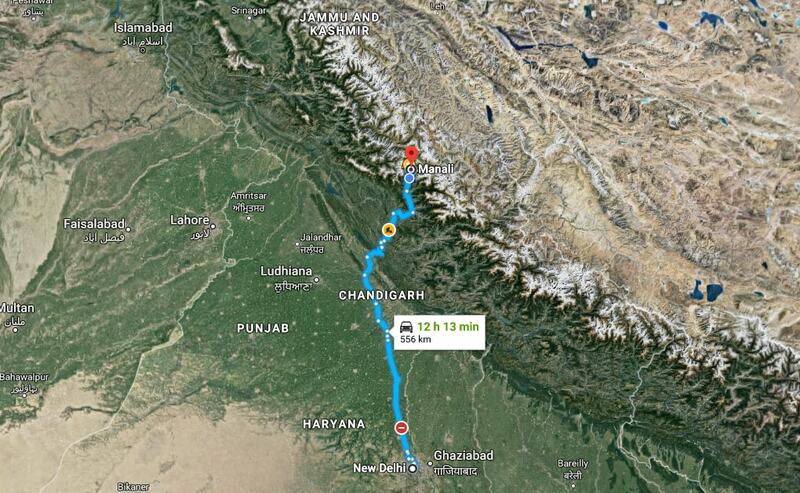 The Distance between Amritsar to Manali is approx. 400 km and it takes 10 to 11 hours to cover this distance by car. HRTC is running Volvo and ordinary buses between Amritsar and Manali. Amritsar and Chandigarh also connect by Railways. The Distance between Dharamshala to Manali is approx. 236 km and it takes 7 to 8 hours to cover this distance by car. HRTC is running Volvo and ordinary buses between Dharamshala and Manali.